Alter The Press! managed to sit down with Ned and Jamie of Pennsylvania’s own, Title Fight, prior to their set with Polar Bear Club; at the sold out Camden Underworld. The guys spoke to ATP about playing overseas for the first time, being a band from the age of twelve, signing with Run For Cover Records, touring with New Found Glory and Four Year Strong, plans on releasing a full-length album and more. Alter The Press: How has your first trip overseas been, so far? Jamie Rhodan (guitar/vocals): It's been fun. Lots of people have been coming out to the shows, good reactions, met good people. Basement is a good band from the UK, check them out. We've been getting good reactions first time round. It's great. Ned Russin (bass/vocals): We were unsure how it'd go over, as it’s our first time over here, and Shook Ones and Polar Bear Club have been over here a couple of times. The response has been awesome, the kids are stoked we're over here, it's going well, we're having fun. It's awesome. ATP: What were your expectations about coming over to Europe? Ned: We just got off tour with Four Year Strong in the US, and that was possibly the best tour we've done so far, it was crazy. There were 500 kids at each show, going crazy and stuff so, going from that, to a brand new territory, where we've never been, don't know anybody; it’s is very intimidating. I was just hoping that there were kids there; I didn't care. If there were kids there, who were willing to check us out, that's all I was hoping for, and we got that. It definitely met my expectations. ATP: How did you guys get together? Ned: Jamie and I met from school. Ben (Russin - drums) is my twin brother, so I've known him my whole life, and then we met Shane (Moran - guitar) through school too, and just had a similar taste in music. We actually started out as a three piece, just Jamie, Ben and myself and then, in 2005, we added Shane on guitar because we finally found use for another guitar player, pretty much been playing ever since. ATP: You've been a band for almost seven years now. How does it feel to be able to play to bigger crowds, and now, play shows overseas? Jamie: It definitely feels like we're doing some right. Me and Ned started this band in sixth grade and used to practice over the phone, have our guitars play through the phone. Coming from that, to playing shows overseas, is pretty rewarding. ATP: You started Title Fight when you were twelve years old, are you still playing the same songs from then? Jamie: Those songs don't actually sound like the new ones do, we just chill on them. They are cool to throw in randomly, like we did in New York recently; that was pretty sweet. Ned: For the most part, we are playing stuff from the new 7" and the Kingston 7", and maybe two or three songs off the split we did (with The Erection Kids in 2007.) It's fun to play older songs sometimes. We kind of stopped playing them for about four/five years because we got kind of bored of them but, when we play at home, we'll play some older stuff. Also, at the same time, we did write that stuff when we were twelve. I doubt a lot of people even know it, so I’d rather not play it. ATP: What were your influences when starting the band? Ned: When we first started out, we were like a Blink-182 rip off band, and that's what we wanted to be. We were a three piece like them because we wanted to be like Blink-182. Over time, things kind of progressed. We had all these new influences and we progressed from a simple pop-punk band, to where we are now. 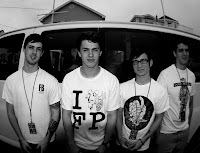 ATP: You've recently toured with Four Year Strong and with New Found Glory last year. How did you hook up with those guys? Ned: New Found Glory knew about us through Scott Vogel, of Terror, a mutual friend of ours and Chad (Gilbert, New Found Glory.) He was trying to hook us up with anything. Scott called us and said, "Hey, New Found decided they wanted to do a tour before the Dashboard Confessional tour, as a small intimate thing, and it's going to be for two weeks, do you want to do it?" We said we could do a week because we were all in college at the time, and couldn't miss much of that because we'd probably get in trouble. After, I started talking to Chad, and told him we could probably do a week of it, but Chad said we have to do all or nothing. That's when it came to a point where we we're thinking, ‘we could go to school at anytime,’ and decided to do the New Found tour, which definitely put us in a good spot. Four Year Strong actually happened because we played the last show of the 'Gig Life' Tour with Four Year Strong, Set Your Goals and Fireworks. They told us they were going out in January and if we wanted to hop on that tour. This was actually at the same time we were trying to figure out if we could balance school and the band. When we decided, we hit them up and said we'd love to do that tour still. ATP: You have released two EP's so far, any plans for a full-length? Jamie: We're writing it now, and have all of April off from shows, so we are going to try and write as much as we can. We also have a few weeks off in March too, but it's not set in stone. Hopefully, we can be done with it in the summer, and record it then as well. Ned: We'd like to have it out this year, if possible. We are trying to figure that out right now. Already, we have some rough demos that we did in a basement, with a voice recorder and a phone in the middle of the room, but, hopefully, we're going to have it all figured out when home in April. ATP: Your latest release, 'The Last Thing You Forget', was released on Run For Cover. How did you end up signing with them? Ned: We played with Fireworks at our local show in Kingston and gave them our split. They loved it and asked us to hit them up. We made friends with those guys afterwards. Things then kind of fell apart with our record label, Flightplan, that put out the 'Kingston' 7." Right after that, Jeff hit us up and said they'd be interested in putting out our next record, and if we'd be interested. We were just down, he is a really cool guy, the line-up on that label is awesome and we love being on it. Ned: We have no idea when because we're booked until the summer. After the week we go home, we have South By South West, Blood Festival in Richmond, most of April off to write, then going on tour with Set Your Goals and Comeback Kid; then the summer is open for us to record. If everything works out with our record in a timely fashion, we'll be back by the end of 2010. ATP: Anything you would like to add? Ned: Thanks for Europe for letting us in. We smuggled a lot of merch; it's cool. Jamie: Listen to Trainwrecker and Tigers Jaw. 'The Last Thing You Forget' is out now on Run For Cover Records.